City is one of those cards very susceptible to groupthink. The first time anyone gets spanked by the Unstoppable City Stack (“UCS”), they vow that next game they will buy up the Cities themselves. This leads to a City race, which, of course, further powers up the Cities. Maxxed-out Cities are absolute juggernauts, easily drawing your deck with bonus money and Buys to boot. But before committing to blowing all your $5’s on Cities, it’s important to identify the situations under which Cities are likely to become anything more than Villages. 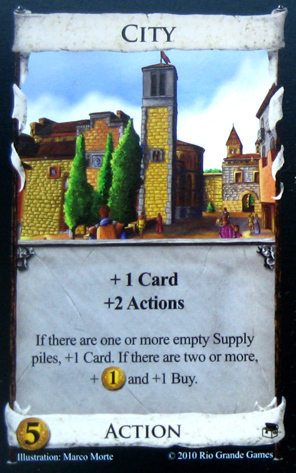 Piles run out most frequently in multiplayer games; similarly, Cities will level up quickly when popular cheap cards are available, like Fishing Village, Caravan, or Peddler. (Great Hall and Island, too, for although they are not technically super-popular, they are fewer in number in 2-player games, and a great pile to run out as the City player.) This is especially true if your opponents are buying Bridges, Talismans, and other Buy multipliers—though you should also beware them ending the game on piles before you have the chance to deploy the UCS. Curse-giving attacks are another reason to invest in Cities, by guaranteeing another pile that will inevitably be exhausted. Of course, there’s the other question of what to do with all those extra Actions. It makes a lot of sense to accumulate Cities when there are uses for the extra Actions, i.e., worthwhile terminal Actions to pair with it (Bridge, terminal attacks, trash-for-benefits, or +Cards like Smithy/Courtyard), and Villages are not available. It also makes sense in Colony games, where you should have enough time to build up the UCS and pummel opponents with it. So when are Cities bad? When the opposite of the above apply. When it doesn’t look like piles are going to be running out, and there aren’t any worthwhile terminals, a player that buys Cities is just spending a ton of money on Villages that become little more than Laboratories when you buy 10 of them. Meanwhile, your opponent can be buying actual Laboratories instead, pummeling you before your Cities can get anywhere. As mentioned several times before, $5 is an elite tier of Actions. Blowing your money on Cities is just not worth it if your opponents, by buying other powerful $5 Actions, can buy up the Victory cards before your Cities upgrade into something better than a Village. There’s a caveat to this rule: it’s easy enough to resist the allure of City if there’s only one opponent buying Cities. But if you’re in a multiplayer game and two players are racing for Cities, you may have little choice other than to get Cities yourself, even if it means contributing to the emptying of the pile. Otherwise they will empty the pile and then hold a huge advantage over you. Likewise, if you’re in a City race with your opponent, and the Cities are split somewhat evenly, it is absolutely critical not to be the one to empty the first pile (unless it is the City pile itself), as it gives your opponent first crack at a mega-turn. The difference between drawing 1 and 2 cards is huge. Ideally, you’d like to use Ironworks, Remodel, or Upgrade to empty a pile during your turn so you can be the first to make use of the UCS. Ironically, when your Cities finally do hit maximum level, you might want to consider winning on piles rather than glamorous Colonies. After all, two piles will already have been emptied; the plethora of Buys your UCS provides might give you the win just by emptying the Estates (or another pile), if your opponents haven’t yet built up a significant lead. This entry was posted in Prosperity and tagged city. Bookmark the permalink. Just want to say, I love your blog and have really enjoyed all of the thoughts you’ve fleshed out so far. Please keep up the great work! Likewise, if you’re in a City race with your opponent, and the Cities are split somewhat evenly, it is absolutely critical not to be the one to empty the first pile (unless it is the City pile itself), as it gives your opponent first crack at a mega-turn. I’ve practiced this as well but I also often don’t take the last city either. You think the benefit of an additional super city is worth going second with them? Would that change if cities were going to be the second stack to empty and your opponent got the buys and money too? It depends. If no one has taken Provinces/Colonies yet, then I can afford to give my opponent a free turn knowing that I’ll have a stronger engine than he does. If we’re both fully drawing our decks, then emptying the first pile doesn’t matter too much. But, if, like you said, it’s emptying the second stack, and maybe a handful of Provinces/Colonies are already gone, then the extra City probably isn’t going to pay off much for me. I think you hit the nail on the head here when you mentioned groupthink. I think city is as psychological a card as Torturer or Ghost Ship. I think city is very easy to misplay, and can be misplayed in multiple ways. It’s so powerful but can go so wrong in many different ways. I think restraint is important when dealing with cities. If your opponent is the first to buy cities, diving in and buying them too will often lead to your opponent being at least 1 or 2 cities ahead in the split, which can lead to a massive loss if your opponent draws their deck more easily than you. If, on the other hand, you come up with another strategy that does not involve buying any cities (or emptying any piles), you can punish your opponent for all those investments in overpriced villages. Another way to counteract City is to use a VP rush strategy. If you can get ahead on VP, your opponent emptying the piles to upgrade their cities can make you that much closer to a fast win. It’s a sort of natural self-limiting quality of City: It’s an engine card, based on mega-turns. But most engines conflict with rushes to end games on empty piles. Also, if you’re behind on provinces (or colonies), and forced to catch up by buying smaller green cards, if you can’t win before the reshuffle, all the green chokes the engine and your deck falls way behind. I think winning with city necessitates a delicate balance: being the first to use an upgraded city is a huge plus, but you need to take care that you don’t fall too far behind in VP while getting ahead on cities, because the game can end fast when the piles empty. And you also need to have enough buying power too (a level 2 city without +Buy is no good, and a string of level 3 cities without enough purchasing power to utilize the extra buys is also not good). I’m personally not good at playing city, and I find that when I buy it, I lose more than I’d expect, and I’m also able to defeat city more than I’d think. I think it’s a card that requires thinking and skill. Gotta love the refreshing artwork! I wouldn’t say Ambassador is a conflict, because it also provides a nice way of emptying a pile during your turn. Get the 2nd pile down to one card (or in multiplayer, the number of cards less than or equal to the number of opponents), then Ambassador everyone a copy of that card. Boom. 2nd pile emptied.